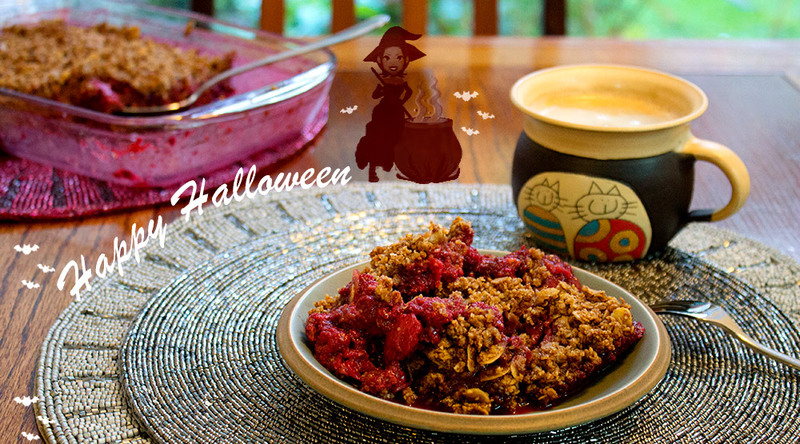 A yummy raspberry and strawberry crumble gently spiced with ginger and cinnamon – perfect treat for these dark evenings. This contains oats which don’t really agree with me but they work so well here I decided I had to use them. I’d like to find a good all-nut version of this crumble – because I love this. I can’t get over how good strawberries and raspberries are together. I’d imagined the tastes would clash because they’re so distinct but actually they each enhance the flavour of the other. I discovered this by accident when I went to make a mixed berry crumble and found I only had frozen strawberries and raspberries. I was desperate for a pudding so I went ahead and made it. They do need quite a lot of sugar or sweetness added and the crumble needs more flavour as well otherwise it gets overpowered. But there was the makings of something really good there. Anyway that is how this came about and it’s a little bit of magic! Place the strawberries and raspberries in a suitably sized oven dish. I used an 11" x 8" dish. Sprinkle over the caster sugar. Grate 3 or 4 pieces of stem ginger and scatter it on top of the fruit. Then spoon in some syrup over all the fruit - it takes about 4 or 5 tablespoons. Melt the butter in a saucepan or in a bowl in the microwave. If using the microwave just give it 30 seconds,, take out and stir, and repeat until all is melted. Stir the brown sugar, cinnamon and ground ginger into the melted butter. Mix the oat, ground almonds and flaked almond in a bowl and then stir in the melted butter mix into this. Top the fruit with this crumble. Bake at 180 C for 40 - 60 minutes or until a fork meets no resistance from the fruit layer. Enjoy with a nice cuppa and a big splash of cream. Frozen raspberries and strawberries, sprinkled with caster sugar, topped with grated stem ginger and a few tablespoons of syrup spooned in too! A lovely sweet and slightly spicy dessert – perfect for autumn. Want to make it even better? Pour on a little cream. OK maybe a lot more cream – honestly this is so good with a big splash of cream. Happy Hallowe’en witches! – And warlocks too, of course.